This example illustrates how you can use the SSM procedure to analyze a panel of time series. The following data set, Cigar, contains information about yearly per capita cigarette sales for 46 geographic regions in the United States over the period 1963–1992. The variables lsales, lprice, lndi, and lpimin denote the per capita cigarette sales, price per pack of cigarettes, per capita disposable income, and minimum price in adjoining regions per pack of cigarettes, respectively (all in the natural log scale). The variable year contains the observation year, and the variable region contains an integer between 1 to 46 that serves as the unique identifier for the region. See Baltagi and Levin (1992) and Baltagi (1995) for additional data description. The data are sorted by year. where each is an integrated random walk. Note that since RegionArray[i] is a binary variable, IrwTrend equals when region is . Lastly, the use of MATCHPARM option specifies that the different IRW trends use the same disturbance variance parameter for their slope equation. This is done mainly for parsimony. Based on the model diagnostics shown later, this appears to be a reasonable model simplification. irregular wn; defines the observation noise , named wn, as a sequence of independent, identically distributed, zero-mean, Gaussian variables—a white noise sequence. model lsales = lprice lndi lpimin IrwTrend wn; defines the model for lsales as a sum of regression effects that involve lprice, lndi, and lpimin, a trend term, IrwTrend, and the observation noise wn. The last two statements, EVAL and OUTPUT, control certain aspects of the procedure output. The following EVAL statement defines a linear combination, named TrendPlusReg, of selected terms in the MODEL statement. The PDV option causes variables such as region1–region46, which are defined by the DATA step statements within the SSM procedure, also to be included in the output data set. This information is very useful in determining the computational complexity of the model (the larger state size, 92, explains the relatively long computing time—as much as two minutes on some desktops—for this example). The index variable information is shown in Figure 27.2. Among other things, it categorizes the data to be of the type Regular with Replication, which implies that the data are regularly spaced with respect to the ID variable and at least some observations have the same ID value. This is clearly true in this example: the data are yearly without any gaps, and there are 46 observations in each year—one per region. Figure 27.3 provides simple summary information about the response variable. It shows that lsales has no missing values and no induced missing values because the predictors in the model, lprice, lndi, and lpimin, do not have any missing values either. The regression coefficients of lprice, lndi, and lpimin are shown in Figure 27.4. As expected, the coefficient of lprice is negative and the coefficients of lndi and lpimin are positive, all being statistically significant. This is consistent with the expectation that the cigarette sales are adversely affected by the price and are positively correlated with the disposable income. The estimated effect of lpimin, called bootlegging effect by Baltagi and Levin (1992), is statistically significant but much smaller than the effects of lprice and lndi. Figure 27.5 shows the estimates of the disturbance variance of the slope equation in IrwTrend and the variance of the noise term wn. The estimate of the disturbance variance of the slope equation in IrwTrend, 0.00017, is statistically significant (being several times larger than its standard error, 0.000022). This implies that the estimated trends are not simple lines with fixed intercept and slope. 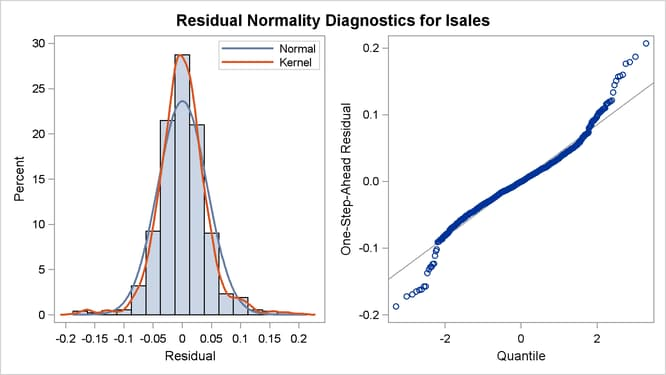 Figure 27.6 shows a panel of residual normality diagnostic plots. These plots show that the residuals are symmetrically distributed but contain slightly larger than expected number of extreme residuals. Figure 27.7 shows the plot of residuals versus time. 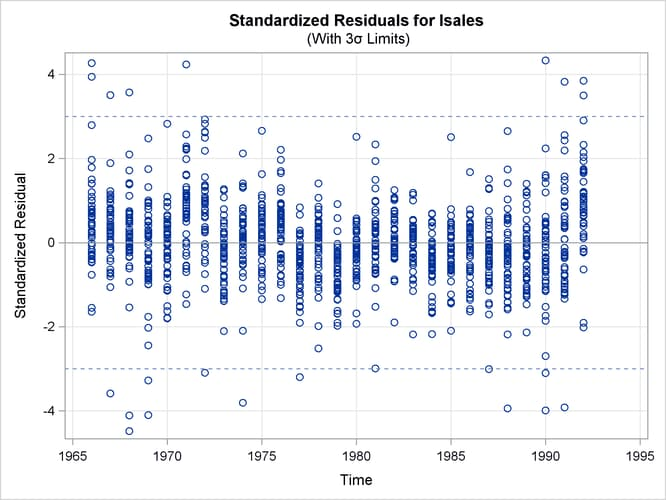 There the residuals do not exhibit any obvious pattern; however, the plot does show that more extreme residuals appear before 1970 and after 1989. On the whole, however, these plots do not exhibit serious violations of model assumptions. Figure 27.8 shows the details of the likelihood computations such as the number of nonmissing response values used and the likelihood of the fitted model. See the section Likelihood Computation and Model Fitting Phase for more information. Figure 27.8 shows the likelihood-based information criteria in smaller-is-better format, which are useful for model comparison. In addition to the regression estimates, it is useful to analyze the estimates of different model components such as the trend component IrwTrend and the linear combination TrendPlusReg. These estimates can be printed by using the PRINT= option provided in the TREND and EVAL statements, or they can be output to a data set (as it is done in this illustration). This latter option is particularly useful for graphical exploration of these components by standard graphical procedures such as SGPLOT and SGPANEL procedures. 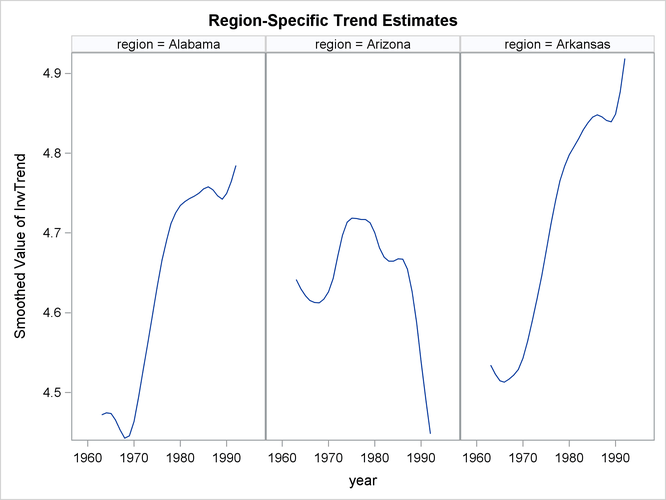 The following statements produce a panel of plots that shows how well the proposed model fits the observed cigarette sales in the first three regions, which correspond to Alabama, Arizona, and Arkansas. The output data set, forCigar, contains all the needed information: Smoothed_TrendPlusReg contains the smoothed (full-sample) estimate of TrendPlusReg, and Smoothed_Lower_TrendPlusReg and Smoothed_Upper_TrendPlusReg contain its 95% lower and upper confidence limits. In addition, for easy readability, a user-defined format (RegionFormat), which is created by using the FORMAT procedure (not shown), is used to associate the region names to region values. 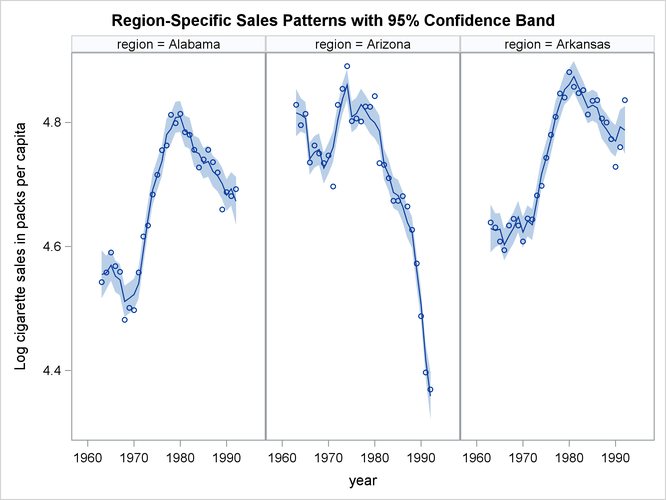 The trend patterns, shown in Figure 27.11, seem to suggest that after accounting for the regression effects, per capita cigarette sales were on the rise in Alabama and Arkansas while they were declining in Arizona.